NEW levels for the Bonus location!!!. ----------------------------------------------------------. We are excited to present you a Great Update!. . New Feature - Collections: for completing levels receive parts of collections as a reward. Gather collections and earn awesome rewards!. . New feature - Bonus Location: 150+ completely new levels! Collect flowers, open treasure chests and get special presents! . . And a lot more of cool stuff coming up soon! 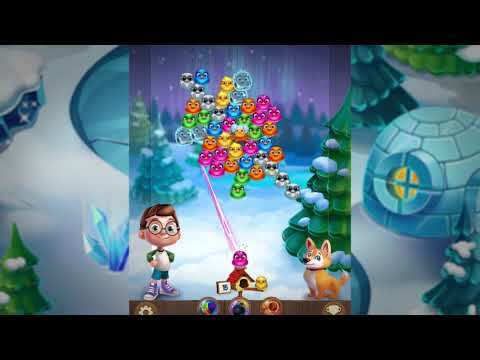 Bubble Birds V match 3 bubble shooter saga represented by Zimad company! Play the classic and great bubble pop game for FREE and help Tom and his lovely pet puppy to rescue cute little birds and other animals from the bubble cages and teach a lesson to the evil birds and their delusional angry lead... see more Bubble Birds V match 3 bubble shooter saga represented by Zimad company! Play the classic and great bubble pop game for FREE and help Tom and his lovely pet puppy to rescue cute little birds and other animals from the bubble cages and teach a lesson to the evil birds and their delusional angry leader! Enjoy the newest part of a classic bubble shooter saga! Match 3 bubbles and pop them in an epic blast! Reveal the story of Tom and his cute pet, and unlock the photographs by shot & beating the levels and setting beautiful animals free. Train your brain and test your matching skills and explore the beauty of the bubble birds’ world, pop bubbles and match 3 the birds by color in our epic saga! Become the master shooter and throw bubbles into the popping flash! It is so much fun! ★ Over 200 bubbleshooter free levels packed with fun and popping beauty! ★ Constant updates to support your bubble mania for free! ★ Multiple amazing and colorful locations — pop & shot bubbles, become a pro shooter & explore the world of Birdland! ★ Free access to play: just install to start your own bubble adventure! ★ New obstacles to battle through with many combinations to keep things challenging! Let the angry birds reign fall apart in a bubble blast popper free buble game! ★ Various Power-Ups and different types of bubble birds — make some flashes and blast bubbles with Bomb Bird, Fire Bird, Rainbow Bird and much more! ★ Save your progress in the game and compete with friends — see who is the best shooter on the leaderboard! ★ Exciting storyline — So many cute animals and lovely birdies are trapped! Why don’t you go and rescue them? Join Tom and his lovely pet puppy, pop bubbles, blast evil angry birds, rescue cute birds and animals and uncover the epic game story! ★ Lovely in-game heroes to accompany your bubble, blaster, spinner mania! ★ Various In-app purchases — pop bubble birds faster and make the bubble flame brighter! ★ Epic gameplay — enjoy the newest version of a classic match 3 saga! Let the bubble burst begin! Follow us for new updates and fun Zimad gems!